There are two beautiful sets of vellum in the catalog, one of which is WINTER WONDERLAND. It has black, gold and silver tones and is perfect for Christmas and winter cards. But, I wanted to make a fall card with this lovely vellum and it worked beautifully! Isn’t this really rich looking! Gold is a perfect match with the Soft Suede card base. Did you notice that there’s no stamping!! This card is all about the Big Shot so it came together easily. The inspiration for this card came from the sketch challenge at Create with Connie and Mary. I love the simplicity of the design, so many options for your cards!! Once my card base was embossed, all I had to do was add a couple layers of vellum plus gold glimmer paper. With all the gold, I needed a bolder greeting that would stand out. “Grateful” die cut in Early Espresso did the job quite well. It was bold enough to stand out, but it still was cohesive. This would be a lovely card in Christmas colors, you could make a bunch to mail out quite easily. Check back tomorrow for the last of the October My Paper Pumpkin cards that I made. Sorry I didn’t get to share them last week as planned, life kinda took over! See you tomorrow! Welcome to another Create with Connie and Mary Saturday Blog Hop! This week we are featuring Christmas cards using NON-TRADITIONAL COLORS. I went with a pastel look using the oh so fabulous SLEIGH RIDE EDGELITS. I love the crisp and clean look that the die cuts give this card. And of course the best part is how easy this came together using the Big Shot. In all, there are four layers of paper that make this card so soft and pretty. I actually started out with the Pink Pirouette base and then added in more colors as the card came together. Soft Sky was next, embossed with the Gently Falling EF. I am SO very glad I got this one, it makes for a beautiful background. Lastly came the layers die cut the the Sleigh Ride Edgelits. This is such a COOL set of dies! The layers look amazing together and you can use them so many ways! The first layer is the trees in Pear Pizazz then the house layer in Tip Top Taupe. I did just a tiny bit of stamping to add the sentiment that came from Wonderland. I think it went beautifully with this card. A few Dazzling Diamonds glimmer stars add the finishing touch along with a stamped envelope. I love this card so much I may have to do it in a bunch of other color combos to use for my cards this year! Have you dived into your October My Paper Pumpkin yet?? I have! I’ve gotten creative with the kit and have come up with quite a few cards to share. Isn’t this super pretty! I absolutely LOVE the colors of this card! I used several components of the kit and then added in several outside elements. It all started with the square piece in the kit that has leaves on it. I took it to the Big Shot and die cut a circle from the center which I saved and used on another card. I cut the 3 x 3 card base from the kit in half to use underneath. Adding in the sentiment and flowers brought the whole thing to life! I added in one more element from the MPP kit, the polka dot matting under the floral element is one half of the mid sized card base. I just added in embossing to give some dimension then put it all on a Pool Party card base. I was so inspired by the pretty colors that I stamped up the inside too! I bet you want to know the colors I used……Watermelon Wonder, Pool Party and Old Olive. If you haven’t given My Paper Pumpkin a try, you should! This kit has been so much fun to use. I created 7 unique cards this weekend, most of them in just one afternoon! I’ll be sharing more over the next week or so to give you more ideas. Here’s the first card I shared last week if you’d like to check it out. I’ve also listed the products below if you’d like to give this particular design a try! You asked and I have delivered! Thank you again for all the lovely comments, I aim to please! 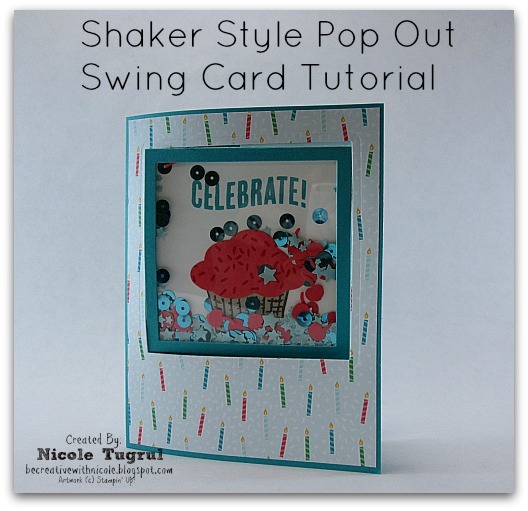 Today I have the video for the shaker pop out swing card that I shared with you on Saturday for the Create with Connie and Mary blog hop. All of the measurements are listed below as well as the supplies. Enjoy! I would love to see what you create, please comment and share the cards that you make!! Bermuda Bay card base 8 1/2″ x 5 1/2″, Score at 4 1/4″ and fold. Cherry on Top DSP, Candle design cut at 4 1/8″ x 5 3/8″ adhered to front, just add adhesive around the outer edges as you will be cutting a square out of the center. Square Framelits to use: 3rd from outside for cutting the card front plus the Whisper White and Window sheet. Inside of card: Whisper White 5″ x 6″ and scored at 2″ and 4″ along the 6″ side. For a comprehensive tutorial on several styles of shaker cards, check out my 30 page SHAKER TUTORIAL. Supplies are listed below, click to find out more info. SHOP anytime and earn FREE STAMPS!